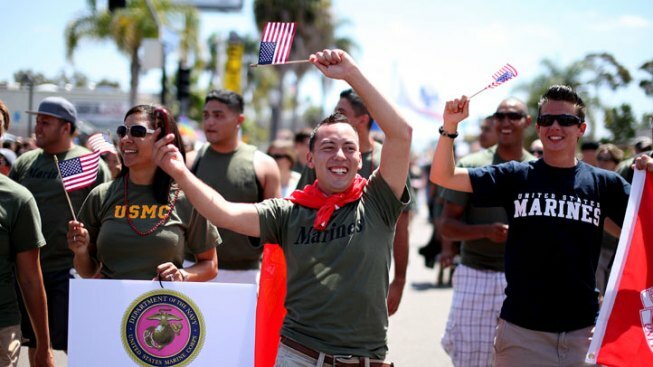 Military servicemen march down University Avenue during the San Diego gay pride parade July 16, 2011 in San Diego, California. Humble, dedicated, fiercely loyal to his country and his fellow Marines. For nearly 10 years, Mike has served his country without wavering spirit and with a hidden secret: He is gay. 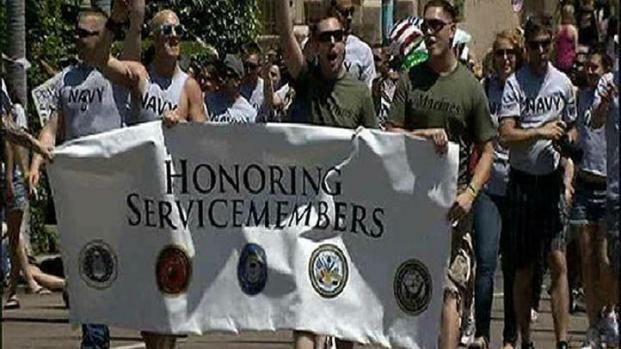 On Tuesday, “Don’t Ask, Don’t Tell” was repealed, ending a nearly 20 year ban on gays serving openly in the military. Now Mike and other dedicated service members will be able to share their sexuality freely without fear. “My service to the Marine Corps, my service to my country has never been about me,” Mike says. For Mike, who asked that his real name not be used, Sept. 20 isn’t the day that he comes out of the closet, but the day he will no longer have to conceal part of his life. He asked that his name not be used because he wants the opportunity to have this conversation with his co-workers on his own terms. It doesn't mean he'll announce to every Marine that he's gay, but it means he can if he chooses. “My service isn't about making a personal announcement, I don't expect any of my Marines to come and say they are straight in case anyone was wondering and I don't think anybody after tomorrow should have to go to work and make the same announcement about themselves,” Mike explained. “This is an opportunity for me to reconcile my personal life with my professional life, in a way that I haven't been able to do for almost 10 years,” he said. Mike, who has dozens of Marines under his charge, is looking forward to the conversation, especially with some who have confided with him in the past that they were gay. A local Marine reacts to the change to "Don't Ask, Don't Tell." 6 p.m.: Freedom to Serve at The San Diego LGBT Community Center (3909 Centre St. in Hillcrest) (presentations from servicemembers, political representatives, plus San Diego’s Michael Magee and retired Col. Stewart Bornhoft, both with Servicemembers Legal Defense Network (SLDN). 6:30 p.m.: An Evening of Service (with Assemblyman Nathan Fletcher at the 94th Aero Squadron (8885 Balboa Ave. in Kearney Mesa). Hosted by the Log Cabin Republicans of San Diego. 7 - 10 p.m.: Salute at Bourbon Street (4612 Park Blvd. in Normal Heights). Salute includes appearances by special guests, formal recognition of LGBT servicemembers and veterans, MAP Salute Awards as well as food, drinks and free giveaways. Hosted by the Military Acceptance Project. For this officer in the Marine Corps, the repeal of DADT means he can live a normal life. An untold number of men and women in the military have been in the same predicament. Many, like Mike, joined the service knowing part of their lives would be cut off to the world. “There are people like me who joined under this policy, knowing what this policy was, knowing that this is just the way life is going to be, and now that it is over my service isn't going to change,” he said. After decades of rules banning gays from serving in military, “Don’t Ask, Don’t Tell” was enacted by President Bill Clinton in 1993. The directive stated that military applicants would not be asked about their sexual orientation, but if they were found to be gay or lesbian they could be discharged from the military. For gay soldiers, the policy made life in the military difficult. “A person's sexuality is a much larger part of them then they think," Mike said. "By saying that you are not allowed to express your sexuality, by saying that you are not allowed to be gay, that means you have to look at what else goes with it. For Mike, the repeal means that gays and lesbians can finally be honest. The fear of his superiors finding out about his sexuality doesn’t scare him. Mike believes the Marines' penchant for order and procedure will outweigh any repercussions.